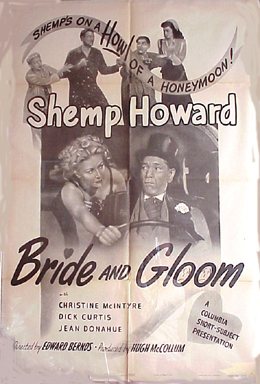 The DVD shown below includes BRIDE AND GLOOM (1947) and all of Shemp's other solo-star Columbia shorts. It also includes the shorts made by Joe Besser and by Joe DeRita before they joined the Three Stooges. Very rare and interesting material! Things were picking up and Emil's next film role came less than a week after his last role in ANDY PLAYS HOOKEY, in another short subject. This time, Emil found himself working again with Shemp Howard but in a Columbia short starring Shemp himself. The two had met three months earlier while shooting ONE EXCITING WEEK, a Republic Pictures feature film. 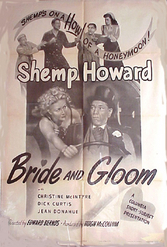 At this point in time, Shemp had been starring for several years in his own series of comedy shorts at Columbia Pictures, but BRIDE AND GLOOM turned out to be the last one he would make as a solo star. Several months later, fate would make a Stooge out of him, but that's another story. Right into it I went. Out of the car I went into the gates of Columbia Ranch, and into a mud-puddle! It was almost like that, for in about a half-hour all told I was ready to go home! The scene wherein the taxi-cab of which I am the "dumb-driver" is stuck in a mud-hole and which has me nonchalantly picking my teeth while Shemp Howard, the well-dressed bride-groom is ankle deep in the wet mud trying to push the cab out. Altogether we did the scene twice. I was to gun the motor a while, splashing Shemp with the muddy water & then relax before I'd deliver my one line "It don't look like we'll make it!" The first time the director, Ed Bernds, forgot to signal me when to say it (as per instructions). But the second time I did everything O.K., with my own business with a tooth-pick & cigarette added, and the big "take" & lines "Hey, how about my fare? The meter's still running, you know!" Cut! Emil takes a small drag on a cigarette in this film, but he never smoked in real life. If you watch closely, you will see him puff and immediately cough just before he delivers his lines. He had no tolerance for the smoke and couldn't suppress it, even for the camera. It was a small cough though, and apparently Jules White didn't mind enough to re-shoot it. Emil's next role, in a Monogram Pictures feature film called DON'T GAMBLE WITH STRANGERS, was also small. Soon however the roles would start getting too big for diary entries.